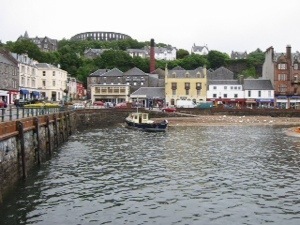 Oban – which came first? The whisky or the women? Well, the whisky of course, the women (and the men) followed later. The town grew up around the distillery which was established in 1794. It is now a resort town with as many as 25,000 visitors every year and is known not only for whisky but is sometime known as the Seafood Capital of Scotland and the Gateway to the Isles. Here is a lovely view if it from the sea. In the background (the Colosseum lookalike) is McCaig’s Tower which can also be clearly seen dominating the view in this next piece of original art work. 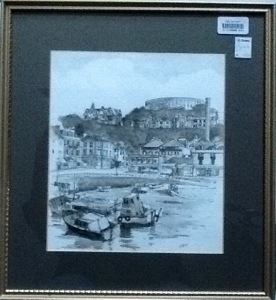 Sadly not signed but clearly labelled Oban and executed in pen and ink. It only cost £3.99. An absolute bargain for such a fine piece of drawing.